The traveling life might suit her father's personality, but 13-year-old Olivene "Ollie" L ove longs for a real home. She yearns to stay in one place long enough to go to school, make friends, get to know her neighbors. She dreams of living in a house that doesn't move, a house that's big enough to hold her family of six, a house equipped with a flush toilet, a Frigidaire and other new-fangled gadgets. It's 1957, after all, and everyone else gets to enjoy such luxuries. Except the Loves—they live in an old travel trailer, which they pull around the South, stopping every time they find a small town that looks ripe for some of the Rev. Everlasting Love's preaching. It's not a bad life, Ollie just wants a better life. When the Loves pause in little Binder, Arkansas, Ollie heads to town to hand out flye rs advertising the three-day revival her father's holding. Along the way, she meets Jimmy Koppel, a scruffy boy about her age. She's curious when she learns his mother's in jail for murdering his father, but she becomes downright furious when she sees how badly Jimmy's treated by the people in town, just because he's one of those "no-good Koppels." When Ollie's new friend confides in her that he knows his mother's innocent, Ollie vows to help Jimmy clear her name. But solving a murder takes time, not to mention the patience of Job, and Ollie has neither. She has to get to the bottom of the mystery before Virginia Koppel is transferred to a prison in Little Rock, before the surly sheriff kicks her family out of town, before Jimmy gets taken away. It won't be easy to find the truth, especially when the people of Binder are happy the Koppel problem will be going away in one fell swoop, but Ollie has to try. No matter how dangerous the consequences may be. 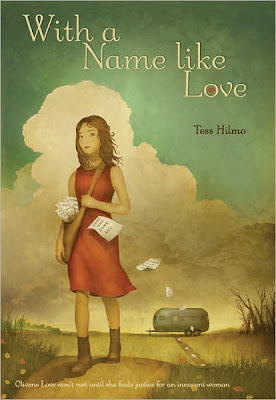 Author Tess Hilmo describes With A Name Like Love, her debut novel, as a "Southern murder mystery full of heart and soul." I happen to agree. It's a warm, atmospheric book with vibrant characters, earnest prose and strong, but subtle messages about the importance of faith, family and friendship. Although religion plays a central role in the story, With a Name Like Love isn't preachy at all, just affirming. A wholesome, uplifting read, this middle grade novel can be enjoyed by both children and adults. If you need a little pick-me-up after reading all the dark, depressing books on the market, I highly recommend you get yourself a copy of this one. You won't be disappointed.